Is this working? Is what we’re doing to respond to the global challenges we face working? Is it sustainable? This is what I think about everyday as an ecologist and as a woman. How do I answer these questions? And how do I contribute to finding solutions to the problems we face? I want to help ensure we have sustainable ecosystems: fresh food, clean drinking water, clean air to breath and a natural world to enjoy. This is the support system we need to survive. I am drawn to research which seeks to answer these questions. I believe that by continually assessing and learning from our actions and research we can also continually improve what we are doing and respond to our changing environment. As a scientist, as a woman, and as a community member I value the contributions of others because, although many say we are the problem, I strongly believe we are also the solution. We all have ideas, knowledge, technical expertise and the capacity to take action. We just need to harness this and apply it. Together, we can make a global shift for the better. We’re not seeing the forest for the trees. Look at the current global leaders and, particularly within science, you’ll notice a lack of female representation. That means we are missing the ideas, knowledge, expertise and capacity of half the population. Women naturally possess a number of qualities beneficial to leadership, including a collaborative spirit, long-term legacy thinking and wise use of assets (financial, time, people) for the greater good. Science and technology will be key in solving the global challenges we face. Imagine the contribution leading female scientists could make? While the number of women studying STEMM (science, technology, engineering, maths and medicine) subjects is slowly increasing, those that pursue scientific careers and move into leadership positions is still inadequate. This can make it challenging to affect change and ensure our voice is heard and our vital expertise are drawn upon. This is where I have a part to play and a contribution to make. And my opportunity to have an impact. And the vision to upskill 1000 women in STEMM over 10 years with skills and experience to actively contribute to scientific leadership, problem solving and to influence decision making for the future of our planet. I have been selected as one of 95 other women from around the world taking part in the fourth iteration of the program. We represent 33 nationalities, and 25 different STEMM disciplines. Together we will take part in an 11 month virtual leadership program culminating in a 21-day expedition in Antarctica. This group of women is incredible and I am so humbled to take this journey with them. Together we will learn, experience and share. We will join a global network of women ready to use our unique skills in collaboration with those around us to influence action and decision making. This isn’t about women taking over, this is about everyone working collaboratively, through equal opportunity and representation to affect change. In doing this, we hope to positively impact your future. We’ll need your help along the way - because you all have something to contribute too. If you believe in the value of science, of women, or all voices being heard, of everyone being a part of the solution then you are on my team. Right now you can contribute by making a donation to support my program costs. And perhaps taking part in some of the fun activities I have planned, or by taking home a special reminder of the bigger picture you are contributing to. Be sure to follow my blog and instagram account for updates on what's happening and my reflections as I take this exciting journey over the next 18 months. The total cost of the Homeward Bound year long program and voyage to Antarctica is over AU$40,000 per participant. Though approximately AU$15,000 of this is covered through in-kind contributions, participants still need to cover the remaining AU$25,000. When you make a donation you are investing in your faith in me as a leader, from which I take so much encouragement, and in the ideals and values of the Homeward Bound program. If you believe in the value of science. If you believe in the value of women. If you believe in all voice being heard. If you believe we’re all in this together. Then you’re on my team. I want to positively impact our planet. Women are underrepresented in science and leadership, yet are a force for change. This opportunity will give me skills to lead and contribute to solutions. One-off original handmade imagined bird artwork - you can even give the bird a name! 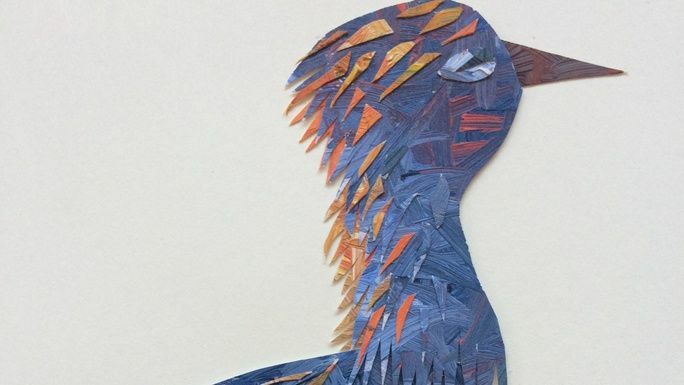 Made from paper, oil paint and glue, these birds are mounted on A3 paper. 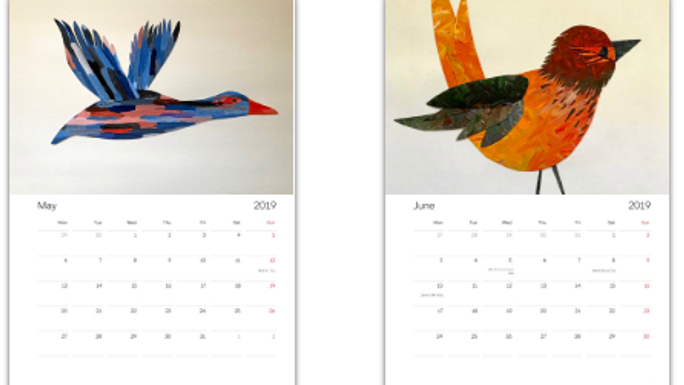 Check out the coldweatherperson blog for the current selection of birds available, or get in touch with Justine directly. Please note that in the event you preferred bird has already been claimed you may need to choose another or wait for a custom made bird to fly to you. Original artwork can be delivered by arranging a pick up/drop off or the bird can be sent to you at an additional cost. Please leave a comment letting me know what you would prefer and i'll get in touch to organise this with you. Pack of four gift cards with prints of my original Imagined Birds artwork, created specifically as a part of Homeward Bound. 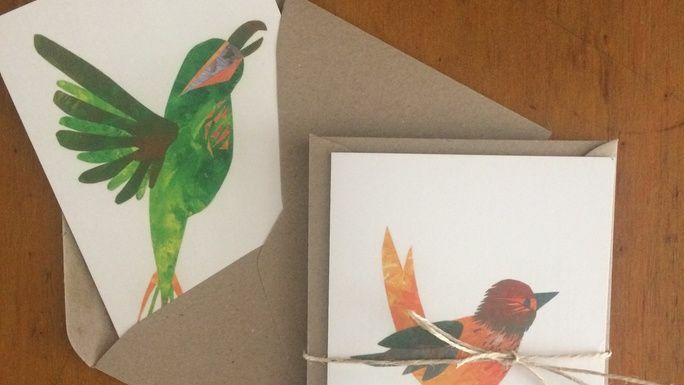 Each pack contains four different imagined birds, printed on FCS certified paper, with recycled envelopes. Cards are blank inside. Est. Delivery Date: Available now.